Herbal dietary supplement for energy. 24 capsules per bottle. 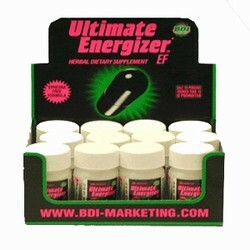 Ultimate Energizer® delivers increased energy levels and enhanced alertness to those consumers who feel tired and sluggish. Our blend of ingredients provides maximum strength for all day relief, with ingredients like Bitter Orange Peel Extract, Caffeine (Anhydrous), Guarana Seed Extract, Green Tea Powder, Asian Ginseng Powder, Yohimbe Powder, Ginkgo Biloba Extract and L-Phenylalanine. This unique formula will leave you feeling ultimately energized! Average Customer Review: 4.5 of 5 Total Reviews: 3 Write a review to tell others what you think about this item. I noticed when I purchased that the price keeps going up. You are pushing customers away by raising the prices.